What could be better than a trio of sources confirming that a sequel to the popular Barnes and Noble Nook Color will be introduced November 7th? How about when that trio of sources and the Wall Street Journal add that in 40 of its most "productive stores", Barnes and Noble will double the size of space intended for the Nook. The construction will be ready in time to attract buyers for the holiday shopping season. The rebuilt boutiques will carry about 2,000 square feet of space for the Nook Color's sequel model and other Nook devices. The additional space in the 40 stores will come from the elimination of music and DVDs. In the remaining 664 Barnes and Noble locations, the Nook boutique will remain 1,000 square feet. The next version of the Nook Color will be a tablet version of the device which is expected to help the book retailer post Nook-related revenues of $1.8 billion in the fiscal year ending in April. That amounts to about 24% of the company's total revenue. According to the tipsters, some of whom work for the bookseller, the refurbished Nook boutiques are gigantic with bright lights, LED television monitors, touchscreen POS systems and is designed to show off more than just two Nook units. The Barnes and Noble Nook Color faces tough competition from Amazon's Kindle series, including the recently introduced Kindle Fire. The latter is an Android powered tablet with a proprietary browser, set to launch November 15th for $199.99. The unit is heavily dependent on content available for purchase from Amazon along with cloud based services that can be purchased from Amazon. 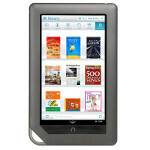 Will the new Nook Color tablet be able to stand up against the Amazon Kindle Fire? If the alleged introduction date is correct, we won't have too long until we find out. Yeah I've got one too and it's fantastic for the price. Finished several books because of it. Don't think I'd need a new one though. Not unless I want to do more than read books... Which I don't. I already have enough misc. devices. No doubt there will be some users upgrading, but but I think it will attract a lot of new people too. Seems like once people have seen the first version, know someone who has one etc, then when a new version comes around, that's often what pushes them to become buyers. Funny, I was just talking to my wife about how I wanted a Nook or Kindle reader, not so much a tablet. Really intereted in the offerings here. The Kindle Fire is going to set the standards on Android Tablets. Not on specs but great marketing and great pricing. All of these honeycomb tablets are really decent but way over priced. That is a 7" device, which has about half of the iPad's viewing area. If the Kindle Fire came out with an 8" screen, it will be a better competitor to tablets. Steve Jobs was right, 7" screen is small. Right now, you can pick up the 8" Vizio tablet for $190 at Costco. That is a touch choice, the kindle fire at 7" for $199 or Vizio 8" tablet fo $190. I've been saying this a for long time, the android OEMs are going to have a hard time selling android tablets because the overhang of the existing inventory of androd tablets sitting in the brick and mortar stores that are collecting dusts. Even the new Galaxy Tablets aren't selling based on my checks with the retailers. One more thing, Apple is selling refurbished iPad with 64GB WiFi for $299. That is for $100 more than a brand new Kindle fire, one can get the first generation refurbished iPads. I really like the Nook Simple Reader since I was looking for a really cheap device to read articles on the web. The reader was light weight, had a low cost, and good screen size for reading articles. However, it was slow at loading and refreshing the pages. I ended up getting the IPad 2, which was an overkill (if I had waited, I could have gotten the Vizio 8" tablet for $190 at costco ). I think BN has a huge advantage over Amazon -- clear, simple products that is honestly asvertised. In contrast, Amazon uses the ad-supported readers to entince the price conscience buyers. The fact Amazon has so many models means they didn't do a good job deciding their best products. I like BN simple strategy of a color or a B/W reader. I hope BN realize there is a market for WIFI ereader / basic web browsers. Many of us like to read articles and don't need to see videos or color photos just the old-fashion newspapers. I believe such a market would have a price limit of $149. Lastly, if I ran BN, I would offer a special of at least 5% discount at its cafe (on top of the 10% discount) for all Nook owners. There's nothing like a good cup of tea and dessert while spending 2 to 4 hours reading in their cafes. That's something that Amazon can't compete with its Kindles.